With their backs against the wall, Kashmir’s desperate youth have started taking up arms against the Indian government. Sixty-nine years ago, the partition of British India gave birth to two new countries: India and Pakistan. Over the years both countries have evolved to be stable, but their contention with each other hasn’t pacified. The two nuclear-armed rivals have fought three wars over Kashmir – a mountainous territory divided between India, Pakistan, and China. August 1947 brought freedom to India and Pakistan but snatched it from Kashmir – a princely state left to face decades of political and social crisis. Fast forward to the present and Indian-controlled Kashmir shows that one’s independence is another’s prison. Once again this year, Independence Day (August 15 in India, a day after Pakistan’s Independence Day), India was celebrating while people in Kashmir observed it as black day. Every year, the region looks grimmer and grimmer. The authorities impose strict curfews, including restrictions on all civilian movements. The streets are deserted and blocked by barbed wire blockades; phones are jammed, and the Internet is down. Kashmir becomes an open air prison. Born in the era of armed rebellion against India that started in the late 1980s, a new generation has again turned to guns to demand their promised right to self-determination. The epicenter of this new wave of armed rebellion is mainly South Kashmir. According to police records, there are 77 militants active in South Kashmir, among whom 70 are locals. Their recruitment is increasing. In Kashmir, young boys in their teenage years are dropping out of schools, colleges, and jobs to live in the forests, knowing that their decision may lead to death at any moment. They don’t wear school uniforms anymore; instead, they wear camouflaged olive green uniforms. They don’t carry a bag of books; instead, they carry a backpack of ammunition and assault rifles. Most of these boys haven’t seen their families for months or even years. They are famous among the youth. Their pictures go viral on social media. The one name that almost every youth in Kashmir knows today is Burhan, but he isn’t the only one. Several Burhans have followed him on this path, but why? And who is Burhan? Five years ago, Burhan Muzaffar was a normal schoolboy whose father wanted him to be a doctor and see patients for free on Sundays. One day, however, his life changed. He had gone out for a bike ride with his brother in their native village of Tral – just 40 kilometers from Srinagar – the summer capital of Kashmir, and a few Indian troopers asked him to buy some cigarettes. Such requests and orders by Indian troops are a common exercise here. Both obeyed but on their way back, they were beaten up without any provocation, according to the family. Khalid Muzaffar, his elder brother, fell unconscious and Burhan managed to run from the spot. While escaping he shouted, “I will take revenge for this.” Two weeks later, he ran away from home, never to return. And so he embarked on a journey against the oppression he faced. He had joined the indigenous Hizbul Mujahideen militant group. In the years to come, Burhan not only rose to fame among the youth but also became one of the most successful and wanted militants in Kashmir. Twenty-one year old Burhan is now the commander of his group in South Kashmir. Living with other militants in the forests since 2010, Burhan has managed to give the slip to death and also recruit many others. A bounty of $15,000 is on Burhan – the authorities are waiting to take him out. On April 13, 2015, Khalid, 25, took some home-cooked lamb and biryani (a traditional Indian rice dish) along to a nearby hill with three other friends. He had gone to meet his brother Burhan, who was accompanied by four other militants. All nine young men sat on the hilltop. The two brothers were sitting at a distance from others when they saw a few troopers walking near the foothill. Mistakenly believing that the army was on a regular patrol in the village, no one panicked. A few minutes later army had zeroed in and opened fire at the group. All the militants managed to run away. The aura around Burhan has grown in such a way that one militant, Arshid Bhai, active in the area, wishes to be buried in Burhan’s graveyard. In March 2014, when Arshid was killed, a grave was dug for him there, but the police gave his body to another village for burial. According to the family, Khalid was not allowed to live in peace after his brother became a militant. He used to be detained every now and then. Police and army troops would raid the house and detain him for days. His father believes that the continuous suppression of youth is forcing them to pick up guns. “When people were protesting against Khalid’s killing, another youth ran way with a trooper’s gun to join the militants. He was in the group photograph too,” Muzaffar reveals. The youth was Sabzar Ahmad Bhat, 25, who joined Burhan’s group that day. The picture that Muzaffar mentions is a group photograph of militants that surfaced on Facebook last month. 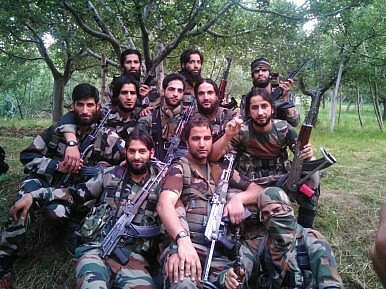 Eleven uniform-clad boys with guns are seen in the picture, and there, between them, is Burhan. The picture went viral on the Internet. The police couldn’t trace the image’s roots. Sources said that, outside of the 11 militants features in the picture, another four were watching and two were taking the picture—bringing the total to 17. A few days later, a video of the same militants surfaced too. All of them are in their early 20s. The Srinagar-based general officer commanding (GOC) of the 15 Corps of the Indian army, Lt. Gen. Subrata Saha, recently said that the number of new militants is increasing in the region. Saha told reporters that there has been a growing trend of educated youth joining militant groups, especially in southern and northern Kashmir. “A time comes when such movements surge and this is the time when the movements have increased across the state. But at the same time we have also intensified our operations accordingly,” Saha said. The killings never stop in Kashmir. Last year, 220 people were killed, among them 106 militants, 52 civilians, and 45 Indian troopers. This year, in just the first seven months, 104 people have been killed, which includes 48 militants, 22 civilians, and 24 Indian troopers. According to police records, 76 militant attacks were carried out in Jammu and Kashmir in the first seven months of 2015, compared to just 86 attacks throughout 2014. There are 185 militants active in the state, as per the police. The data given by the Jammu Kashmir Coalition of Civil Society, a prominent human rights group, shows that 347 militants were killed over the last four years. Of this number, 100 militants were killed in 2011, 75 in 2012, 73 in 2013, and 99 in 2014. According to their annual reports, 192 civilians and 271 Indian troopers were killed between January 2011 and December 2014. In contradiction to Saha, however, Burhan’s father observes that religion and oppression have played a major role in the rise of the militancy. “No one’s heart in Kashmir is with India. Even when there is a cricket match between India and Pakistan, all are with Pakistan. Kashmiris are against India. It doesn’t matter how many militants are there, but in general people are anti-India. It is a volcano against India. When Burhan was tortured, that all exploded,” Muzaffar told The Diplomat. The mass protests of 2008 and 2010 were two significant events in Kashmir’s recent history. Baba, the political analyst, observes that after 2000 there was some hope that Kashmir was being addressed seriously, but by 2008 and 2010 this hope faded. “These two mass uprisings were a huge mobilization of young people. It transformed the Kashmir issue and discontent from older to younger generation but the state dealt with it with heavier hands. They were snatching all hope of peaceful public demonstrations from the people,” says Baba. He opines that it is much more dangerous today to participate in public demonstrations in Kashmir as people are constantly watched, targeted, and arrested. Under the draconian Public Safety Act (PSA), all this has become a matter of routine process. “In such an atmosphere, the youth find that the way out is to use weapons and to do it more clandestinely. It is not alarming yet, but it could increase the way things are going and that can be dangerous,” he adds. Dozens of youth who have become militants follow the same pattern. The reason they choose this path is a combination of Islam and oppression. Twenty-two year-old Showkat Ahmad Lone, from the Lelhar village of Pulwama, 30 kilometers from Srinagar, was an automobile mechanic. The youngest among five brothers and four sisters, his life started changing after the 2010 mass protests. On November 25, 2013, Showkat told his family that he was traveling to Delhi with a local lorry driver, as was usual for him during the winters. “He was 17 years old then. He left and we knew it is normal. But a few days later the army raided our house. We searched for him everywhere. We thought he may be missing and filed a missing person report too,” Bashir adds. After that night, Showkat never come home, but on August 11, 2015, he was in the paddy fields of a nearby village, exchanging bullets with Indian forces. His family back at home had no knowledge that Showkat, now a Lashkar-e-Taiba militant, was caught in the gunfight. Around that afternoon, Showkat and another local militant were shot dead by dozens of Indian troopers who had cordoned off the area. The family received his bullet-riddled, bloodied body later that evening. The men in the room showed us two pictures of Showkat. Taken in 2013, one picture shows him as a small boy, wearing a T-shirt and sporting short hair. Another picture from 2015 has him carrying an AK-47 rifle, wearing a camouflaged uniform, and a headband. His transformation in two years is not surprising to his family and neighbors. A resident from just a few meters away from Showkat’s house, 23-year-old Mohammad Ayub Lone, has been missing since May 2015. One among three brothers and a sister, Ayub was a driver but was continuously harassed by the authorities. Following a pattern, during the 2010 mass protests, he was also throwing stones, just like Showkat and many others. For that, he went to prison for six months, booked under the PSA. Later, he was imprisoned for three more months. The Army then told the family that Ayub had joined the militants. The raids at their house still continue, however. “The conclusion is that the authorities use force against our youth. We doubt whether the Army has kept him or if he has left the state. He used to drive a cab and the army accused him of transporting militants,” Rouf Ahmad said. Back in Tral, which has become the center of this new and young militancy, five kilometers away from Burhan’s home, 19-year-old Ishaq Ahmad Parray has perhaps followed Burhan. He has been missing since March 16, 2015. Ishaq was a meritorious student and would score high marks in his high school tests. Due to his impressive academic performance, he earned the nickname “Newton.” He was preparing for competitive engineering and medical tests as he went missing. On a snowy day, Ishaq once asked his father for 1,000 rupees so that he could pay the remaining fee of a computer-coaching center. Just before noon, his father gave him the money and Ishaq left with an umbrella. “I asked him: do you also need bus fare, but he said no, looking through the half-opened door and left,” Mohammad Ismail Parray, his father, told The Diplomat. “I had dreams of him becoming a doctor or engineer, but now it seems he has left everything behind.” The only picture of Ishaq that is left is a passport size photograph that his father carries in his pocket. This week, a five-minute video message by Burhan started circulating over WhatsApp in which he addresses the people of Kashmir. He calls for a boycott of India and also asks that people to pick up arms and support the ongoing militancy movement. The video is the first such address by a militant commander in Kashmir. Fahad Shah is a journalist and editor. He is the editor of the anthology Of Occupation and Resistance: Writings from Kashmir (Westland, 2013) and also the editor of The Kashmir Walla magazine. He tweets at @pzfahad.